Our Blue Stackable Recycling Bin has an angled front & hinged lid to allow access to multiple bins when stacked. 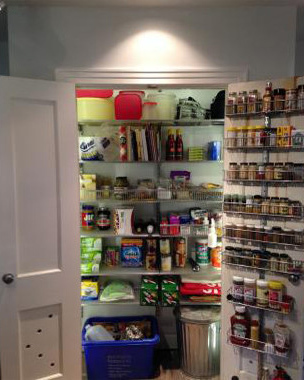 The hinged lid can also stay open for easy access when not stacked. Use the included labels (Plastics, Paper and Glass) to ensure your recycling is sorted properly. Blue 13 gal. Stackable Recycle Bin is rated 4.4 out of 5 by 71. We have a wide window seal off the kitchen and want to set the bins on that ledge. It is approximately 12&quot; deep and 35&quot; wide. Thanks! Can these be used for human food in the garage? For instance, for flour and sugar? Can 3 be stacked on each other? We do not recommend these to be used to store human food. Also, we recommend these to be stacked no higher than 2 high. Do the lids snap shut? In other words, can a baby get into them easily? The flip-up lids of our Recycle Bins are not designed to be toddler- or child-proof.